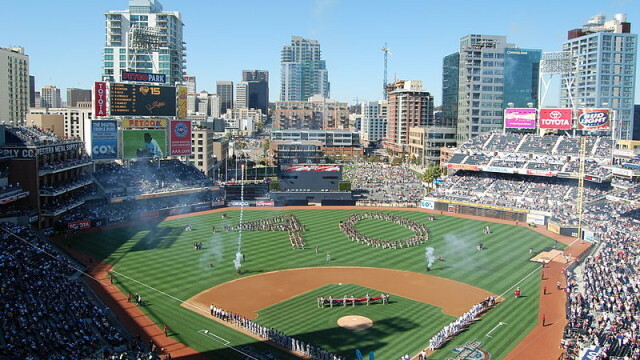 The San Diego Gay Men’s Chorus this morning called for an investigation into why its members were not allowed to sing the national anthem at Saturday night’s Dodgers–Padres game at Petco Park. The Padres issued an apology last night via Twitter. That wasn’t enough for the executive director of the chorus. Bob Lehman issued a lengthy statement on the group’s Facebook page. “What should have been a night of joy and celebration at Petco Park last night, instead turned into a nightmare raising serious questions about homophobia within the San Diego Padres organization and its relationship with the LGBT community. “Before the start of the last night’s San Diego Padres game, 100 volunteer singers of the San Diego Gay Men’s Chorus took to the field to proudly sing the National Anthem. Instead, in front of the large crowd gathered for the L.A. Dodgers game, the San Diego Padres played the recorded voice of a woman singing the anthem. The Padres said they would not have further comment Sunday beyond last night’s tweet. However, they did retweet a statement this afternoon by former Padres player Billy Bean, the only openly gay former or current Major League Player. “The San Diego Padres have supported our inclusion message at MLB without hesitation even before my return to baseball in 2014,” the statement said. “They have made every effort to include the LGBT community and champion equality in MLB for each and every one of us.